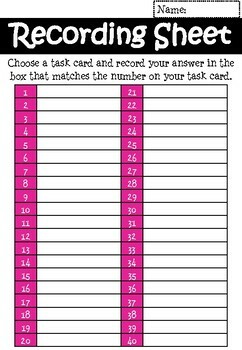 This decimals task card set includes 40 colourful cards, an answer key, and recording sheet. They come as PDF printable sheets that can be laminated for long-term use. 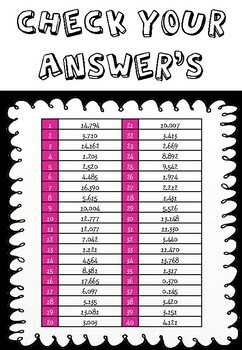 Includes written form decimals up to the thousandths place. 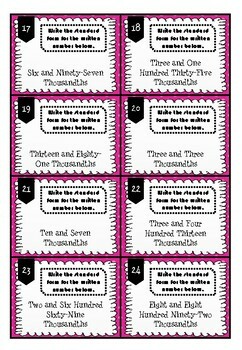 Perfect for a whole class lesson, for students to use during math rotations, or as a fast finisher activity. I hope enjoy using these in your classroom! Some other products by me that are available now! 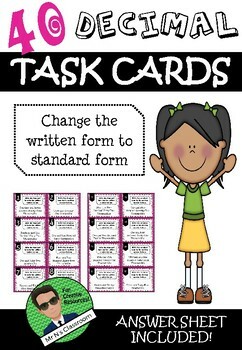 Please leave feedback to get some TpT credit! Go to your My Purchases page. Then next to each purchase you'll see a 'Provide Feedback' button, click it and you will be directed to a page where you can give a rating and comment on each product. Each time you give feedback, TPT gives you feedback credits that you use to lower the cost of your future purchases. Be the first to know about my new discounts, freebies and product launches! Look for the green star near the top of my page and click it to become a follower of Mr N's Classroom.